One of the best decisions I ever made in my life was becoming a librarian…twice. Once as a school librarian and again as a public library consultant. As an English teacher, I loved sharing great short stories and books with my students. It was one of the best parts of the profession. So when I heard about an alternative certification program to become a school librarian, I jumped at that chance. I realized quickly that I didn’t truly know all of the things school librarians were responsible for and all of the things they did. However, I learned very quickly. While I was working on becoming certified as a school librarian and earning my MLS, my journey began. I had no clue I would one day become…The Dual Librarian! I am so thankful that I had a support system through my alternative certification (AC) program when I became a school librarian. It was a lot of on-the-job training since during the AC program, you became a full-time school librarian as you learned and became certified. When I first start programming for my middle school students, it was difficult because none of them stayed after school – they were all bus riders. I had to get creative. I realized that our students had plenty of time in the morning after they ate breakfast and sat and socialized in the open “auditorium” area. So I began doing programs before school! During one Teen Read Week, I got the teachers involved and did competitions such as Are You Smarter than a Middle Schooler and Name That Tune. It was great! It gave our students something constructive to do and let students and teachers learn more about each other and see each other in different ways. It also helped them see the library as a fun place and more students started to be active in the library. In high school where my students did stay after school, I started programming with only academics in mind. However, I quickly realized that I could program events that were not academic at all, like scary movie nights and game nights just to get students in the library. 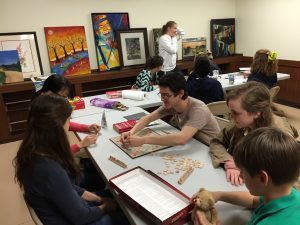 Other events were connected to academia like book trivia, book clubs, and the Straight Talk program which went over topics that students were interested in like college readiness and health. I learned I needed to do anything I could to connect to the culture of the school and do programs that my students really wanted. Right as I was beginning to get my in my groove and feel successful as a school librarian, an opportunity came up to shake up my world. 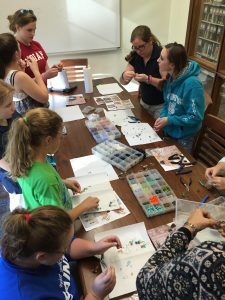 After presenting at a conference, I was approached by a small town public library director who wanted help engaging the tweens and teens in her town. Her town was 20 minutes from where I lived and worked as a school librarian. She did not have the funding for a full-time teen librarian and wanted to know if I would do some programs for her. I told her that I would volunteer to do some programs; however, she quickly turned me down. She began teaching me how to be a real consultant, saying she would not use my talents without paying me. She told me to go to my school district to find out my hourly rate and that is what she would pay me. We quickly fell into a smooth groove of creating programs, promoting programs, and having no one show up to programs. The library was very small and old and I knew teens would not come in for the average program. A new library was being built, but that would not help me in the present. I decided I needed to stop trying to promote to teens at the library and instead get to the adults that could influence them to come. I went to the local middle and high school to advertise and I got the librarians on those campuses on my side. I joined the local reading council to let English teachers know what we were trying to accomplish. I sent events to the local newspaper and created video advertisements for anyone to use. The tweens and teens started coming! However, I had another trick up my sleeve! I created a Teen Library Council. I learned very quickly that being a public librarian did not come with a set audience, so I needed to find a teen crew and have them not only tell me what they wanted, but to bring the rest of the teens with them. It worked. My Teen Library Council were amazing! They came up with programs, they invited and brought their friends, and they had fun doing it. If you want to know what teens want, ask them! They will tell you what they are interested in and what they want to come to! Reach out! Public librarians, reach out to your local schools. School librarians, reach out to your local public libraries. You can work together to bring the awesomeness of libraries to our next generation! Tweens and teens don’t have to learn from every program! Just like adults, they need to turn off their brain from time to time and just have fun. They do not have to learn a lesson from each program you provide. Do a silly program, like a Hunger Games Style Competition, or a chill program, like a pajama movie night. Mix those in with more serious programs like college readiness and financial preparedness for seniors going to college. Try to remember when you were that age…what were you interested in? Program it! Whatever your role as a librarian, have fun doing it and don’t lose the true focus of helping your patrons be their best selves! Take it from the dual librarian – getting out of your comfort zone can create a safe, fun place for those who really need it. Ms. Desiree Alexander, Ed.S. is an award-winning, multi-degreed educator who has been in the educational field since 2002. She is currently the Regional Director of North Louisiana for the Associated Professional Educators of Louisiana. She is the Founder CEO of Educator Alexander Consulting, LLC. She consults with members of several schools/businesses and presents at conferences nationwide. Ms. Alexander is lifetime certified in Louisiana in Secondary English Education, as a Reading Specialist, as a School Librarian, as an Educational Technology Facilitator, as an Educational Technology Leader and in Educational Leadership 1. She is certified in Texas as a Principal, in English Language Arts and Reading for grades 4-8 and grades 8-12, as a Reading Specialist for grades EC-12, and as a School Librarian. She holds multiple technology certifications, including, but not limited to, IC3 certification, Google Certified Trainer, Google Innovator, Apple Teacher 2016, and a Microsoft Innovative Educator Master Trainer. She holds a Bachelor, a Master + 30, and an Education Specialist Degree in Curriculum and Instruction from Louisiana State University. She holds a Master of Library Science from Texas Woman’s University. She holds a Master of Educational Leadership with a concentration in Educational Technology Leadership from Nicholls State University. She is currently pursuing a Doctorate in Education with a concentration in Educational Leadership from Lamar University. She is one of the 2017 Young Professional Initiative 40 Under 40 Awards Honoree, 2017 Center for Digital Education Top 30 Technologists, Transformers & Trailblazers, 2017 PBS Learning Media Digital Innovator for Louisiana, 2016 A+PEL Member of the Year, 2015 Librarian of the Year for Louisiana Librarian Association, 2014 Leader of the Year for Region 2 Louisiana Association of Computer Using Educators, and her recent campus's 2015 Teacher of the Year in the Zachary Community School District. Learn more at www.educatoralexander.com. « Mark Your Calendars! Giving Tuesday is Nov. 27!